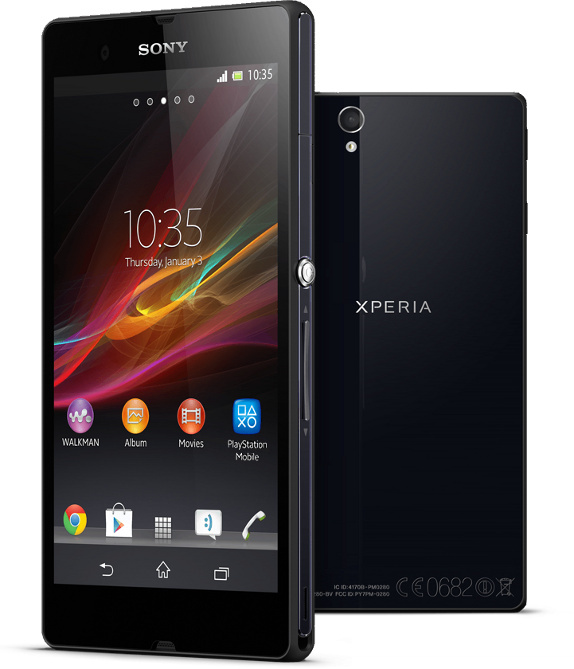 the role of the brand's flagship phone from the Sony Xperia T , although the latter will still continue to be sold as well. There'll also be Sony Xperia XL, which is only very slightly different to the Xperia Z, although we're told that this model won't be coming to the UK. The new flagship handset sports a big 5-inch screen and it's also water resistant - good news for clumsy gadget owners. It's set to go up against top-tier phones like the iPhone 5 , HTC One X and Samsung Galaxy S3 , but has it got what it takes to make it into our list of the best smartphones around? We went in for a closer look. much svelter profile than the likes of the Nokia Lumia 920 . The "omni-balanced" design features tempered glass back and front for slick, symmetrical aesthetics. You'll also find a nice round aluminium on/off button half-way down the right-hand edge. Not only does it act as a premium style statement, it's also very easy to find at a glance so you won't be searching around for it when you first pick up the phone, as with some rivals. It's certainly the best-looking Sony phone yet, with the brand seemingly having finally shaken of the somewhat dull designs of its Ericsson partnership. The handset will be available in black or white, plus a purple model that will be exclusive to O2. - with the exception of the recent Panasonic Eluga . The Xperia Z packs the IP57 standard, which means that its water resistant up to 1m for 30 minutes. The phone also has Sony's brand new Mobile Bravia Engine 2, which has been designed for crisper detail, more saturated colours, and real time contrast optimization. What's more, this is the first phone to include Sony's EXMOR RS sensor, enabling HDR. You'll find a 13MP camera on the rear (with 1080p video), along with a 2MP front-facing cam that can deal with 720p video. Sony has also ported over the Superior Auto mode from its camera - this adjusts settings automatically to suit different light levels and movement, so in theory, the camera should perform well in low light conditions - usually the bane of the camera phone. Other extras include Sony's Sweep Panorama, along with various other picture effects and a burst mode, operating at 10fps and taking any number of consecutive shots, until the memory is full up. As with most of Sony's latest mobile product, the Xperia Z supports NFC one-touch operation and Sony willbe introducing a selection of compatible products including a tiny, ball-shaped Bluetooth speaker. The phone will also support 4G - for all UK LTE networks. One of the key features of the new phone is its massive 5-inch screen which makes it larger than the likes of the HTC One X and Samsung Galaxy S3. The display sports a full-HD 1080p resolution along with an pixel density of 443, compared to the iPhone 5's 326. The screen felt very responsive, and touchscreen operation even works when the display or your hands are wet - very useful for drizzly British weather. Details on the screen appear pin-sharp and colours are bright and punchy. The extra pixel density is something that will really help when it comes to videos and zooming in on web pages. The handsets sports a 2370mAh battery and Sony has also thoughtfully included a feature called Battery Stamina Mode which is designed to conserve as much battery life as possible. The idea is that when the screen is off, the phone automatically turns off everything else, except for telephony. The mode isoptional and you can also tweak the settings so that you can choose apps to leave on - for example, so that you can get email and social network notifications. According to Sony, the new mode can extend battery life by up to four times. The phone also has a Low Battery Mode which, when enabled, turns off all non-vital functions automatically as soon as the battery power drops below a certain level. As we'd expect, the Xperia Z runs the latest version of Google's mobile OS - Android Jelly Bean. Sony has added its own twist on top of the Android UI, so that the homescreen includes shortcuts to Sony services - Walkman, Album, Movies, Sony Select - and has been designed to look the same across all Sony devices. Powered by the quad-core Qualcomm Snapdragon S4 Pro chipset, the phone appeared to be pretty zippy when switching between apps and browsing the web, but that's something we'll look at in more detail in our full review. There's 16GB of storage on board, plus the option to upgrade via a microSD card slot, along with 2GB of RAM. At first glance, the Sony Xperia Z is the most impressive phone that we've seen from the company in a long time, possibly ever. The big screen may divide opinion, but there's no denying the design is slick. The good looks combined with the water resistance, Battery Stamina mode and impressive camera chops make this one smartphone to watch in 2013.